Planning to go for a camping trip alone and looking for a best 1 person tent? Well if the answer happens to be yes. Then you better stick with this page.The market is filled with quite a lot of options when it comes to 1 person tent. But the question is which one is the best one among them? Well, this is the question that many of us have in their mind. However just to help you out, I have handpicked some of the best 1 person tent for you. So you can easily choose the right one for yourself. At first, on the list, we have the ALPS Mountaineering Lynx 1-Person Tent. This is one of the best selling 1 person that you can find in the market. The shelter has a base size of 2’8 x 7’6, and it has a centre Height of 36 inches. The total weight of tent is about 4 lbs. 4 oz. and the minimum weight is about 3 lbs. 8 oz. Overall the ALPS Mountaineering Lynx 1-Person Tent is extremely lightweight. In addition to that, the tent comes with no assembly frustration. The tent is easy to setup as it a free standing tent. All you have to do is attach the pole clips to the aluminium poles and you are done. As far as the build quality of the product is concerned, well it is a polyester tent which is water resistant. The shelter makes sure that you are not getting wet at all, even at the extreme weather conditions. Plus it is UV damage protected and has enough space so you can comfortably sleep. The tent is a fully equipped one and comes with 8 zippers that include, storage pokers, gear loft, stakes, guy ropes and one doorway. In the end, we would say that this one a best 1 person tent under 100 dollars that you can get. 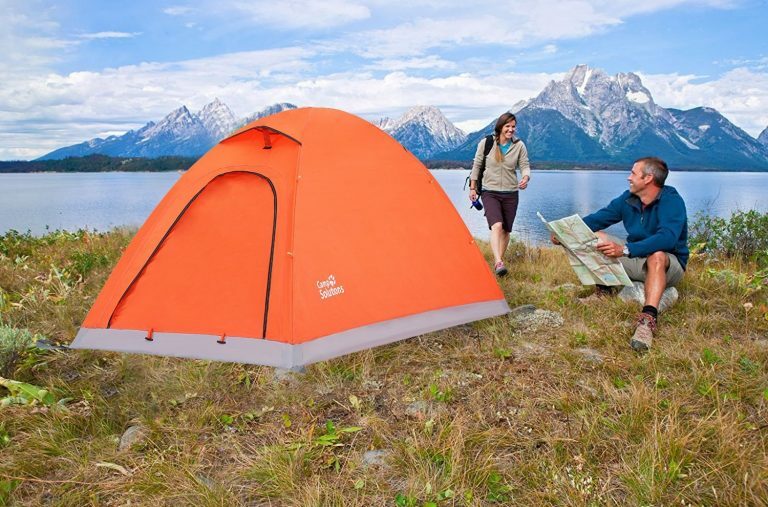 The Eureka Solitaire Tent is one of the best 1 person tents under $100. This tent comes with a bivy style camping design. Also, it is a perfect solution for those who are not willing to spend lots of bucks on a lightweight tent. 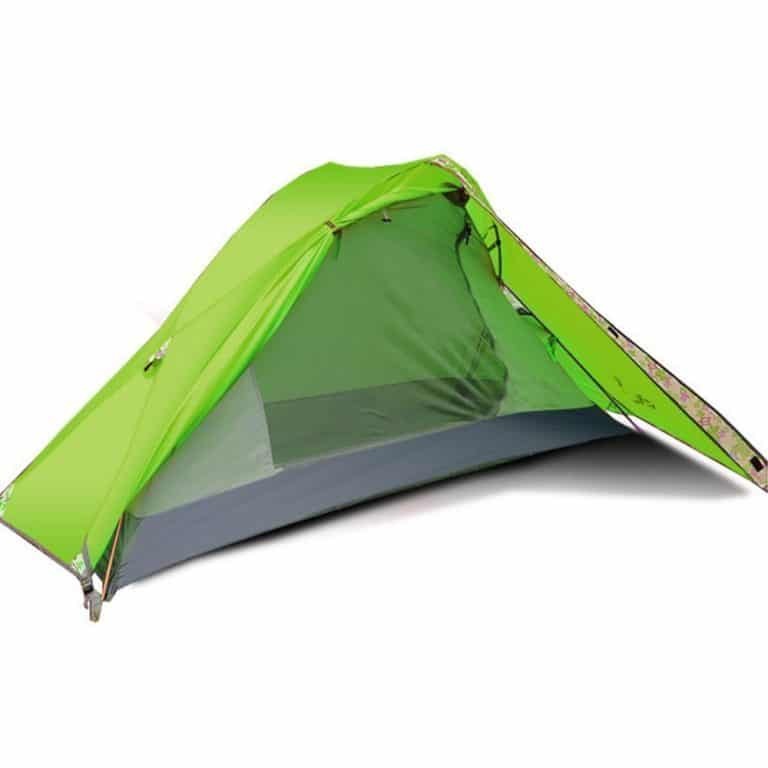 The Eureka Solitaire Tent is extremely lightweight, and it weighs less than 3 pounds only. This makes it the best budget backpacking tent on a budget. 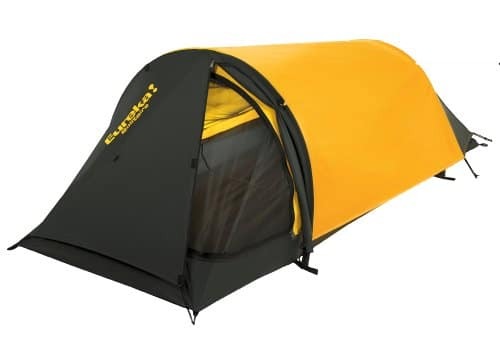 The tent has an inner net tent and comes with a waterproof floor and an outer rain fly. There are two durable 6.3 mm fibreglass frame also included with the tent, and they are shock corded. This means you will easily be able to setup the tent within minutes. All you need to do is insert the poles into the fabric sleeves on the outer fly and set it up. Also, the material of this tent is pretty awesome, and it is weather resistant. In addition to that, the shelter has enough space for you. So you can sleep comfortably. However, the tent would not be a great choice if you are planning to camp in rainy weather or a place where the humidity level is extremely high. 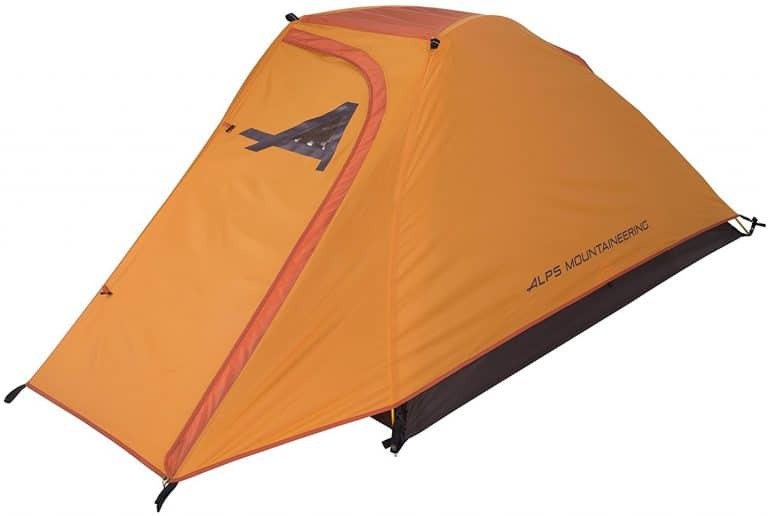 Up next we have another ALPS tent which is the ALPS Mountaineering Zephyr 1-Person Tent. The tent comes with a base size of 3’8 x 7’2 and has a centre height of 36 inches. The overall weight of the tent is about 4 lbs 5 oz, and the minimum weight of the tent is about 3 lbs. 10 oz. Also, let me mention that the tent is super lightweight. As far as the setting up process is concerned, well the tent comes with no assembly frustration. In fact, each and every tent under the company’s Zephyr Tent series comes with no assembly frustration. This is a free standing tent and has two pole design. The poles are made of aluminium and you can setup the shelter within minutes. The tent is made of polyester, and it is water resistant as well as UV damage production. Plus it has enough room for the camper to sleep without any issues. It comes with great ventilation and has two mesh doors and entire mesh walls. The tent is a fully equipped one and has 8 zippers that include storage pockets, gear loft, aluminium stakes and guy ropes. In the end, I would say that if you are going to camp in an area where the humidity level is high. Then this is the best 1 person tent that you can find in the market. Up next we have the Flytop Single Person and single door Tent. The tent is 82.53 inches long x35.37 inches wide and has a center height of 39.3 inches. The total weight of the tent is only 3.56lb or 1.62kg which is extremely light and that makes it easy to carry out and load anywhere. The tent comes with a single door for entry and exit which make it a best 1 person tent. The poles of the tent are made up of aluminum which is also a lightweight material. The tent provides enough space for a person to sleep comfortably. It is made up of waterproof fabric material which protects from rainfall and has ventilation window which protects from heat and also provides good air circulation in the tent. Even it also protects a person from heavy wind and snowfall. So it is totally secure to be carried out in every season. 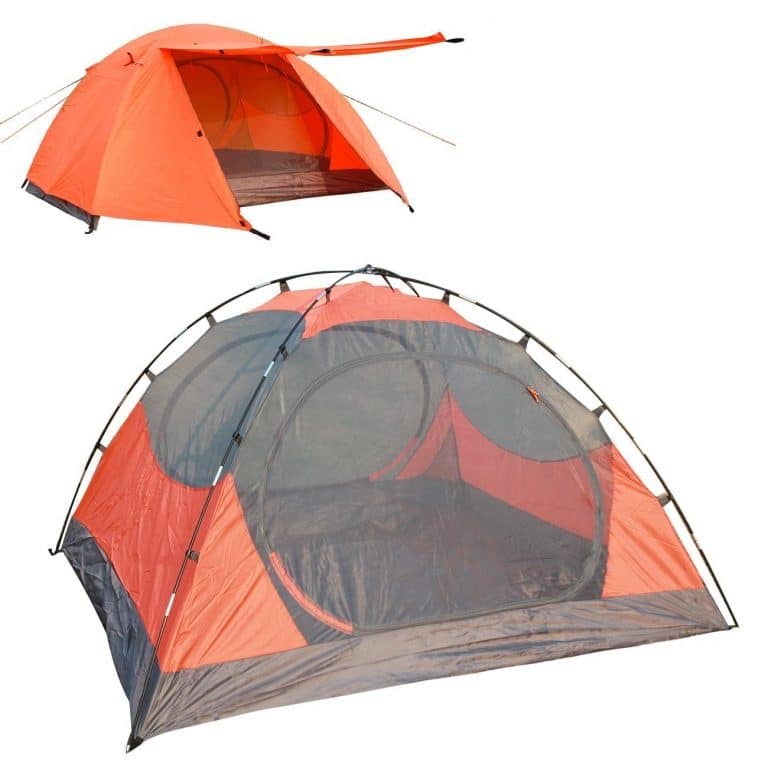 Due to such features, it is best suited to be called as all season one person tent. One can easily carry it for trekking, riding, hiking and camping as well. 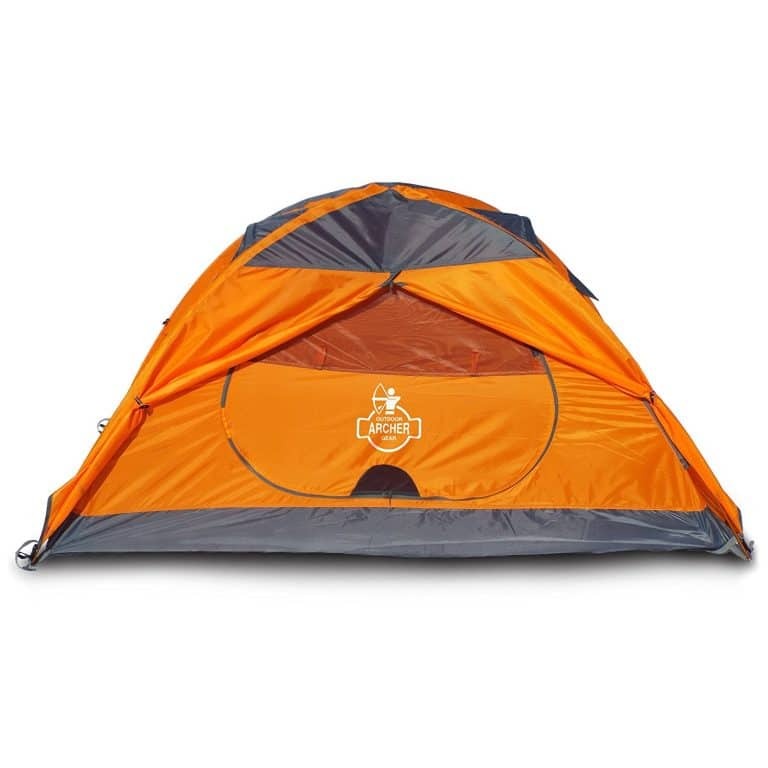 The next tent in our top 10 list is Archer Outdoor Gear 1 Man Camping & Backpacking Tent. It measures 210cm long & 100cm wide with a height of 110cm from the center. The overall weight of the tent is only 1.8kg or 4 pounds which makes the tent light to load anywhere and easy to carry on back. The tent is supported by aircraft grade aluminum poles which are light and sturdy. The tent is made up of Polyester fiber with waterproof nylon bottom which provides strength to the tent and protects from rainfall. It is also built to be protected against annoying bugs and flies, hence covered with a polyester fly sheet. One can easily be fit inside it and be protected as well from rainfall, heat and wind. So you can take it to Trekking, hiking, camping, etc without being worried about your safety and privacy. It comes in an attractive color combination of orange and grey. The setup includes pegs, wind ropes, and a convenient accessories storage bag. Overall it is a best 1 person tent that you could find in the market. 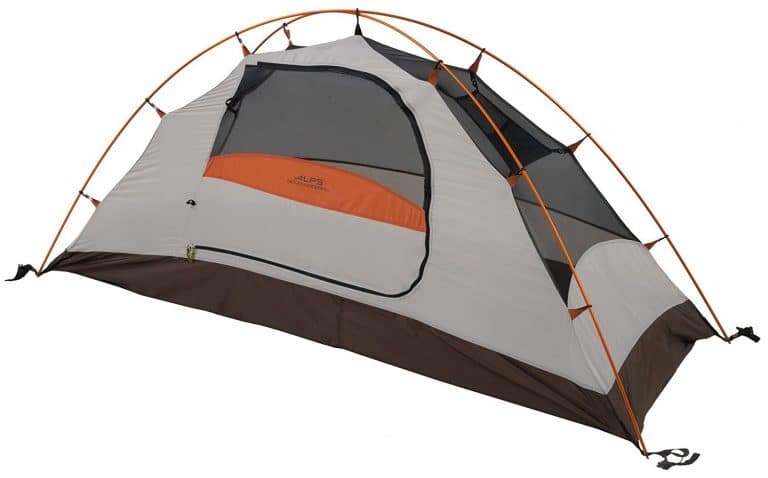 The next tent on our list is Camping Solutions Outdoor Backpacking 1 Person Tent. The tent measures 78.7 cm long & 47.2 cm with a central height of 39.4 cm. It carries a weight of 3.88lbs which maintains its weight low and helps a person to carry it easily on his back. The tent can be set up with 2 Aluminum poles. The person just needs to attach pole clips of the tent with the Aluminum pole, dig the nail with wind rope in the ground and attach to the tent and he is good to use it. It is made up of waterproof material, hence protects against heavy rainfall conditions. The tent comes with one door for entry and exit which also works as a ventilation system for good passage of air. The company has taken great care of their product and has sealed the fly and floor seams and coats of the floor as well so that rainfall would not enter inside the tent. The whole package consists of 1-person tent, 1 convenient carry bag, 2 lightweight aluminum poles, 8 nails and 4 wind rope. So make sure you are checking out this best 1 person tent. Now, we have the Happy Camper Two Person Tent. As it’s names says, 2 person can be easily fit inside it. If we talk about its dimensions, then its 42inches long & 60 inches wide with a central height of 76 inches. It carries a weight of 3.13 pounds which is very light and can be taken anywhere easily. The tent is made up of Nylon material which is a durable and sturdy material which maintains the strength of tent and keep it safe from rainfall. The tent is made in the shape of a Dome with a large D Shaped Door which is convenient and Spacious as well. Some pockets are also installed inside the tent for keeping things safe. One can use it for all the weather conditions. Its windows work as a ventilation system for passage of air, nylon fiber works as waterproof material and protects from rainfall. The package includes a Portable storage bag, a tent, 2 poles and some other basic things. 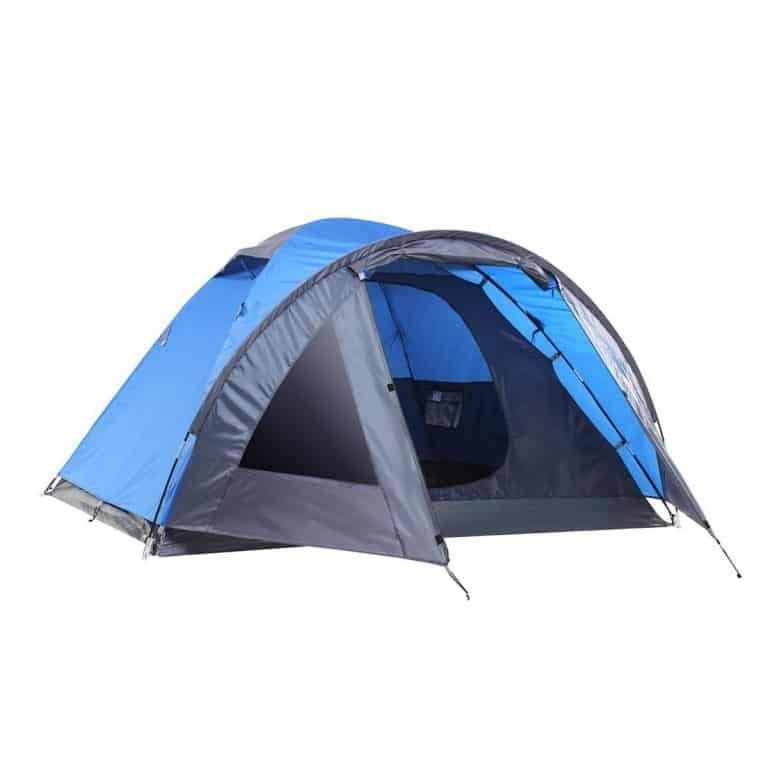 It comes with Bold Blue variant also it is one of the inexpensive yet the best 1 person tent that available in the market. 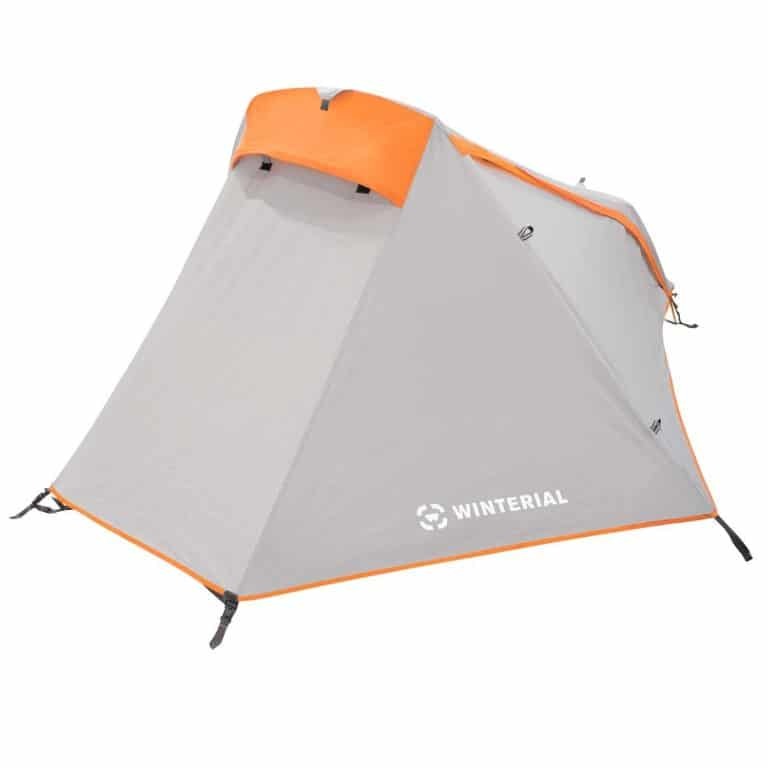 Well, Winterial Single Person Tent is one the most attractive tent I’ve found for you. The tent measures 38inches long & 28inches wide with a central height of 90inches. The tent is quite wide and comfortable which makes it the best 1 person tent in the market. It weighs only 2.9lbs which quiet light as compared to its size. It can be easily carried into a bag pack. The tent can easily be setup due to the two hoop design. The 2 Aluminum poles have the strength to hold it tight in any weather condition. It’s made up of waterproof material which surely keeps you safe from rainfall and the anti-fly coating protects you against bugs and flies. It can be used in almost every season, mainly in summer when the nights are warm, the ventilated roof mesh provides good air circulation and in rainy/winter when the nights are cold, the coated rainfly material plays its role. Whether you want to go Hiking, Trekking, camping or wherever you like, it will work like a charm for you. The package includes a tent, 3 bundles of cord, 2 aluminum poles, 14 heavy duty stakes, a bag pack, (maybe some are not mentioned) . The tent comes in grey color. The next tent for today is LETHMIK Portable Outdoor Backing Tent, this one is also a best 1 person tent. 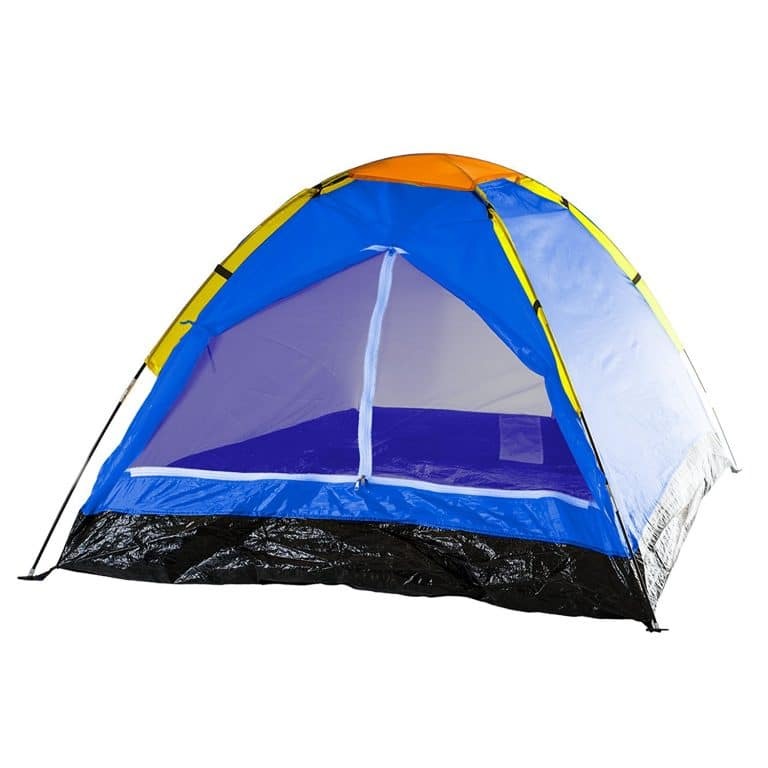 The tent measures 81inches long & 71inches wide with 47inches as centered height. It weighs only 2.8kg or 99oz or 6.71 pounds so can be easily carried on back. It comes in 3 different colors, i.e Blue, Green, Orange. The tent can be easily installed with high strength aluminum poles & lightweight. It can resist in any weather condition. It consists of a two-way zipper door which can be used in 2 ways, i.e., either tight both sides of zip or add door curtain for more convenience and durability. Windows are placed on both the sides of the door which can be used for ventilation. Also, windows can be closed for preventing from heavy wind, rainfall, and even bugs or flies. The whole tent is made up of Polyester Waterproof Fiber to maintain the strength and protect from rainfall or snowfall as well. It’s very comfortable for a person, but 2 or sometimes 3 can also be fitted inside it. So you can use it for every season. Also, the whole package includes a tent, 1 carry bag, 2 tent poles, 13 stakes, 1 wind rope, 1 tie. Last but not the least is the SEMOO Double Layer 3-4 Person Tent. It is 94.5 inches long & 51.2 inches wide. It weighs 7.9lbs which is a little heavy but can be carried easily. The tent has a comfortable zone for 3-4 people. So a group of 3-4 people can go out for camping with a single tent. It can be easily installed with the help of a single person. The tent is made of Polyester fiber for strength to resist in any condition and also has a waterproof shield to protect from rainy day or night. It has an internal ventilation system which undoubtedly provides proper air circulation for breathing and keeps environment bug free. Some Pockets are also installed inside the tent to keep little things. 3-4 people can comfortably enjoy inside this Double Layer tent. Whether it’s raining outside or snowfall, this tent has the capability to secure you. So it can be used in all the seasons. Also as this tent has enough space for 3-4 campers. Hence it is definitely a best 1 person tent when it comes to comfortability. that you can try out. The whole package includes a tent, 19 pegs, 6 windproof guy lines, 2 play design for storm protection. Isn’t it an amazing choice? 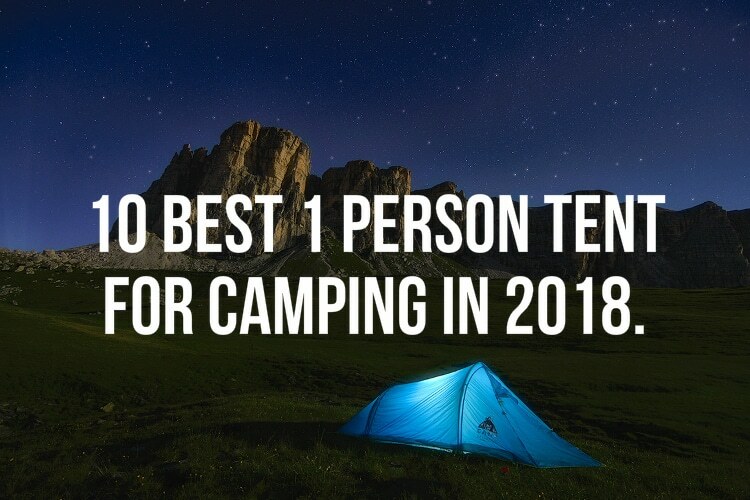 Well those were the 10 best 1 person tent for camping in 2018. Now go ahead and check them out and see which one working the best for you. Also if you have any questions, then do feel free to leave a comment down below.